Every Mothers Day several of us husbands and their children get together and but on a garden dinner for our wives/mothers. This year the 'garden' was inside as the weather was on the chilly side. Around here we are so use to using wild edibles as a normal part of our meals that we sometimes forget that we are using them. Our belief is that wild foods should me just used when camping but as a everyday contribution to our regular food. The highlight of the meal were morels served on a plate with a whole steamed wild leek. We usually always have wild violets on top of the salad for color but this year in the rush of things we forgot them. Even though there were lots of them growing in our lawn. Morels done with butter, soy sauce and a little spice in cast iron frying pan. 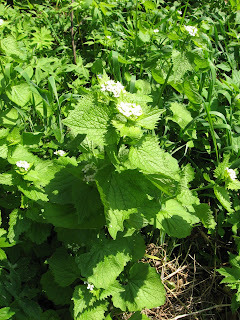 Garlic Mustard- is quite good if prepared right and picked early enough in the season. We had around 24 adults and kids show up. We tried something a little different this time by bringing some cooked leeks and rice for everyone to have a sample along with their nettle tea. Nettles-- Nettle tea is what is in the teapot. Today was our annual Wild Leek Festival. We've been having these for 8 or 9 years now. Every year people come up with more and more dishes that use wild leeks. This plate has stir fried wild leek bulbs and greens, wild onions, nettles, deviled egg with wild violets and 3 other dished that have wild leeks in the. We still haven’t made wild leek ice cream yet! Getting the dirt and roots off. Going though the food line with different dishes of leeks.